LIMA, Peru (AP) -- When Alan Garcia handed over power as his first term ended in 1990, Peru's Congress erupted in a din of catcalls. The South American nation was saddled with hyperinflation and was bleeding badly from the Maoist Shining Path's fanatical rebellion. Garcia leaves Peru in much better shape as he ends his second term on Thursday. Economic growth averaged 7 percent a year during his 2006-2011 administration, inflation held at less than 3 percent annually and the government amassed $47 billion in foreign reserves. The economic numbers only tell part the story, however. While the guerrilla war was largely over when Garcia returned to office, social conflicts in which authorities had to intervene nearly tripled on his watch. 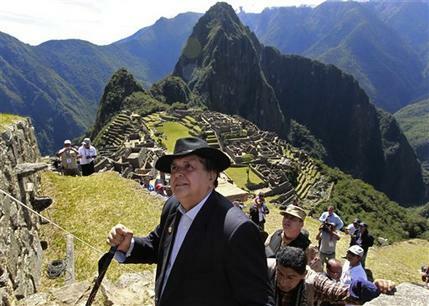 Critics claimed his pro-business policies often ignored Peru's native peoples and damaged the environment. The resulting unrest has claimed 104 deaths and 1,398 injuries since 2008, according to Peru's national human rights ombudsman's office. And few of the underlying conflicts have been resolved. Garcia leaves President-elect Ollanta Humala, an apparently moderate leftist who assumes office Thursday, with a ticking time bomb of disputes stemming in large part from objections by indigenous groups to the damage to water supplies, crops and hunting grounds wrought by mining, logging and oil and gas extraction. "On the positive side, (Garcia) leaves a basically healthy economy," said historian and political analyst Nelson Manrique. "On the negative side, he has been authoritarian, hasn't been open to political dialogue and put off dealing with a series of demands that have generated a climate of social volatility." Garcia favored multinationals bent on extracting Peru's nonrenewable resources at the expense of the majority of Peru's people, his critics contend. The bloodshed dogged Garcia into his last days in office. At least five people were killed last month in clashes with police as highland protesters in Puno state demanded a halt to illegal artisanal mining that has contaminated their water. Other protesters in Puno demanded that a proposed silver mine be scrapped. A strident leftist as president in the 1980s, Garcia gained global fame then for declaring a moratorium on Peru's foreign debt payments. In his second term, he reinvented himself as a free-market disciple, wooing foreign investment. He encouraged a boom in the mining sector, which accounts for more than 60 percent of Peru's exports, and the country became the envy of its neighbors. Its poverty rate dropped from 48 percent to 31 percent during Garcia's tenure. Garcia's signature policy was opening Peru's Amazon jungle to unprecedented petroleum exploration and promoting the interests of mining and energy multinationals, which all too often angered locals. Indigenous groups in the Amazon began to organize against government grants of oil, gas and logging concessions on their traditional lands without their consent. That upset the 62-year-old Garcia. In a 2007 newspaper column, he compared indigenous activists opposed to resource exploitation in the Amazon region to a "gardener's dog" who neither eats nor lets anyone else eat the bounty he jealously guards. Garcia also wrote that the modern environmentalist who rejects the exploitation of natural resources that could make the country rich is a latter-day version of the "old Communist anti-capitalist of the 19th century." That same year, Garcia issued a decree exempting members of the armed forces, which includes police, from criminal liability for deaths its members might cause when called to restore public order. Such cases would instead go to the military justice system. Human rights groups said that gave soldiers and police a green light to kill protesters. In June 2009, at least 33 people were killed in the bloodiest confrontation of Garcia's presidency. His government sent more than 500 police to the jungle gateway city of Bagua to break up a nearly 2-month-old road blockade by Amazon Indians opposed to decrees that would have allowed oil and gas exploration on their traditional lands without their consent. The police opened fire, apparently unprovoked, on the demonstrators. Twenty-three of the dead were police, killed in retaliation. Some were disarmed before being slain. Garcia called the protesters savages. But indigenous leader Alberto Pizango said it was Garcia who acted barbarically by showing no taste for negotiated solutions and no interest in human rights. Pizango is currently fighting criminal charges of rebellion for allegedly fomenting the Bagua protests. prevention with the ombudsman's office. Luque said Humala's biggest challenge will be persuading people that the government can be a trusted partner in resolving conflicts. The 49-year-old former military man who won the presidency in a runoff last month against the daughter of imprisoned former President Alberto Fujimori has vowed to advocate for the masses against special interests. After he was elected in 2006, defeating Humala in a runoff, Garcia promised "a government of dialogue and openness." He said he would not forget Peru's poorest. Five years later, he rejects accusations he has instead encouraged social unrest. "They say there are more social conflicts and, of course, there is five times the amount of investment," Garcia said in a recent interview with the newspaper El Comercio. "They talk about the absence of the state, and I've just mentioned how 978 towns have gotten electricity, how 47,000 computers have been delivered in Puno. Schools and roads have been built in Puno." Indeed, such public works have helped boost Garcia's approval rating to 42 percent in the most recent poll by the Ipsos-Apoyo firm, whose error margin was plus or minus 4 percentage points. It was once as low as 19 percent, a point hit in October 2008. Half of those who said they were happy with Garcia's tenure cited public works, though Garcia, in fact, built far less infrastructure than Alberto Fujimori, who was widely revered in the countryside for paving rural roads, delivering running water, building schools and health clinics. Fujimori was also credited for defeating the Shining Path. Among those unhappy with Garcia, two in three complained about corruption. Just 28 percent said they were unhappy with his handling of social conflicts. Garcia, through his spokesman, has turned down repeated interview requests from The Associated Press. The low point of Garcia's popularity came when Peruvian media uncovered a scandal involving alleged kickbacks in the government's awarding of oil concessions. The scandal forced Garcia to overhaul his Cabinet and fed disillusion among voters, 32 percent of whom opted for Humala in the first round of presidential elections in April. A leading Peruvian conservative who was eliminated in the first round in the 2006 presidential contest, Lourdes Flores, says Garcia can nevertheless hold his head high as he leaves office. "He has managed the economy with prudence. He has managed international relations adequately. I think he was lacking in his social approach," said Flores. "But I do think that he has regained his good name."